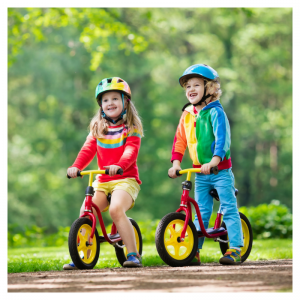 Are you looking to buy a bike for your 3 or 4 year but you're not sure whether to buy a a pedal or a balance bike? Both have advantages and disadvantages but don't write off a balance bike because you think your child may be too old. There are lots of 3 and 4 year olds who love riding balance bikes and children this age can gain a lot of skills which will help them transition onto a pedal bike more quickly.Having said this, it may be worth considering a pedal bike for your child and hopefully the information in this article will help you make up your mind. Which Bike for a 3 Year Old? ​If you're buying a bike for a 3 year old, 3 years old is actually the optimum age for using balance bikes and most kids will do better with a balance bike over a training bike with stabilisers at this age. ​Most balance bikes are aimed at kids at this age and for their height. Most 3 year olds have enough balancing skills and co-ordination to use a balance bike. Some children at age 3 will struggle with the pedals on a training bike as they might not be ready to pedal yet. Which Bike for a 4 Year Old? Making a decision between a balance bike and a pedal bike for a 4 year old is a little more difficult. My own 4 year old had a balance bike from his 2nd birthday. When he was 3 1/2 he was growing out of his balance bike and I felt sure he would be able to move onto a pedal bike. So when it came to replacing his bike, we chose a pedal bike with stabilisers. Unfortunately from the word go he has struggled to pedal on the bike. He will pedal backwards but he can't pedal forwards. We have tried to encourage him to pedal for months now, but he is still having difficulty and he is 4 years and 1 month now. Looking back, I feel we made the wrong decision and we should have gone for another balance bike. Most kids don't learn to ride a pedal bike until at least age 5, so I think at age 4 (unless they are heading towards their 5th birthday), I would still recommend a balance bike. The time that kids take to use a balance bike will reduce the amount of time they need to learn to balance on a pedal bike drastically. My eldest son never had a balance bike as a toddler or preschooler and really struggled when he came to learn to ride a bike. We then took the pedals off his bike and he used as a balance bike for a little while. We then put the pedals back on the bike and he literally rode off straight away. Also, even if they can pedal many children will prefer a balance bike at age 4 because they can go faster on it and have more control. There is quite often an overlap where children will use both a balance bike and a pedal bike until they can master a pedal bike to a sufficient standard that it's just as much fun as their balance bike counterpark. Check out balance bikes for 4 year olds. Which Balance Bikes for 3 and 4 Year Olds? If you do decide to get a balance bike for your 3 and 4 year old, the main thing to make sure off is that the seat is at the correct height so they can use the bike. To use a balance bike, the seat height must be about an inch less than your child's inseam (the measurement between the top of the crotch to the floor). This is so that their feet can be flat along the floor so they are able to push their feet along the floor and move the bike. When to consider getting a pedal bike for a 3 or 4 year old? There are some kids who will get a pedal bike straight away and they may be better suited to a pedal bike. If they can already pedal on a tricycle or a ride on, than they may be able to pedal away on a pedal bike too. If they already have used a balance bike and have mastered balancing and can pedal (perhaps on a trike or ride on), a pedal bike is probably the way to go. What To Look for When Buying a First Pedal Bike? There are different considerations when buying a first pedal bike, which will not apply when buying bikes for children who can already cycle. ​When purchasing a first pedal bike, the child's feet should be able to touch the floor. This is because they will need to learn to balance on the bike while also learning to pedal. It's easier for kids to be able to learn how to ride a bike when they can start and stop with their feet on the floor. So the child's inseam should be the measured so he/she can touch the floor when using the minimum seat height. If they can't put their feet flat on the floor the pedal bike will be too big for them.